Chateau / Country House1550 sq. ft.
It’s the perfect place for the family vacation, writers/artist hangout, lounging on the deck, quad or horse back riding, beach combing, fishing/crabbing/clamming, golf, Sports fishing for spring/fall salmon or business trip. Home is nestled in 5 wooded acres between Joe Ney and South Slough, 2 miles to the Charleston Harbor. Sounds of seals or the fog bouy can be heard certain times of the year. Pop open the French doors and listen to the birds or roast a marshmallow on the fire pit. The home has a wrap around deck for entertainment and a BBQ. Circular drive for easy access with carport, along with a barn/ fenced pasture for horse lovers. Short drive to a day playing on several beaches (watch the surfers at lighthouse beach), step into the Old World Harbor of Charleston for crabbing, clamming, resturants or enjoying the gift shops. Charter a boat for deep sea fishing trip or throw a line off the jetty rocks to catch a Ling Cod. Visit the famous Shore Acres Botanical Gardens ( known for the Holiday Lights from Nov – Jan, beautiful landscaping and history). Great place for a wedding! How about a visit to the South Slough for Kayaking, nature hike or bird watching. Whale watching is a popular sport here…. Speaking of sports – for the quad enthusiast. Jump on the dunes in 20 minutes north at Horse falls. Dunes run up the coast to Winchester Bay, were Dunefest is held each year in August. Tour the Umpqua Lighthouse. Less than 15 minute drive in either direction is Coos Bay or North Bend. Stroll downtown Coos Bay for their shops and restaurants. Enjoy the Wine Walk stroll the 1st Friday of each month until October, farmers market every Wednesday, or join the locals for the spectacular 4th of July fireworks at the Mill Casino. North Bend has a Mall, Bowling Alley and movie theater. Mill Casino is located between Coos Bay and North Bend on hwy 101. They have wonderful resturants, bar with live band entertainment and much more. Go up the Coos/Millicoma River on an all day adventure to hike Golden/Silver falls, enjoy playing in a stream and maybe venture over to the fish hatchery. Just past Charleston is Sunset 9 Whole Golf Coarse for the golfer in you. Travel 25 minutes south to to the lovely dowtown of Bandon for stroll through the shops or play a round of golf at the world renouned Bandon Golf Coarse. Check out the link to upcoming special events and festivals such as the Charleston Seafood festival, Cruz the Coos, Blackberry Festival, Music On The Bay (Free Concerts), 8th Anual Mill-luck Salmon Celebration, Cranberry Festival and Street Rod Show, 25th Annual Shorebird Festival, Oregon Tuna Classic Tournament, South Slough Canoe Trip and much more. We were drawn to the Coos Bay area because of the beauty of the varying landscape from the wooded hillsides to the beautiful tree lined dunes and beaches and for the vast amount of outdoor activities available that put you in the middle of all that beauty. Our family enjoys the beaches, quad riding, horseback riding, fishing and hunting, boating, and relaxed atmosphere that the Coos Bay area offers. We purchased this home as a primary residence so that our family could live in the area that they loved to play in. As a result of a career change, we moved away from the area. We thought that people would enjoy this peacefull location as much as we do and decided to turn it into a vacation rental. By doing this we would also be able to return and enjoy our house for family vacations. Wild birds, chipmonks and deer that visit. Sounds of the seals and fog bouy. Full size dryer in seperate indoor laundry room. Two car garage with attached carport. For use in house only. Not for outside or beach use. New refrigerator/freezer in the house (no ice maker). A deep freeze is available in the Garage for your catch. New remodeled kitchen with new stainless steel appliances. Electric Stove, Oven, Microwave, Dishwasher. (2) Dish Network TV with 2 TVs. TV in the Living room with a DVD Player. TV in one of the Spare Bedrooms. over 1400 square feet of Complete wrap around covered porch that provides extra room to spread out and relax. 1400 sq ft. of covered walk around deck, Fire Pit in back yard, RV Hookup for Power and Water, large front yard for volleyball and games, Lots of room for family reunions. Upon request we can set out Crabbing rings, clamming rake, clamming shovels, Crab pot and cooker, and make the deep freeze available for your catch. We can also set out upon request beach chairs and skim boards for fun at the beach and we also have a WII game for the kids and adults. We stay every year at the Coos for our annual fishing trip. this was our first stay at the Wooded Coastal Retreat and it was a perfect fit for us. Our time spent "back in camp" was the best part of our trip as the fishing was very slow. the Foosball table on the back porch was a nightly favorite. The house was comfortable, clean, and the 360 wrap around porch was very nice. Russ and Janeen were very accommodating to all our needs. we will stay here every year we come back to the Coos if available! 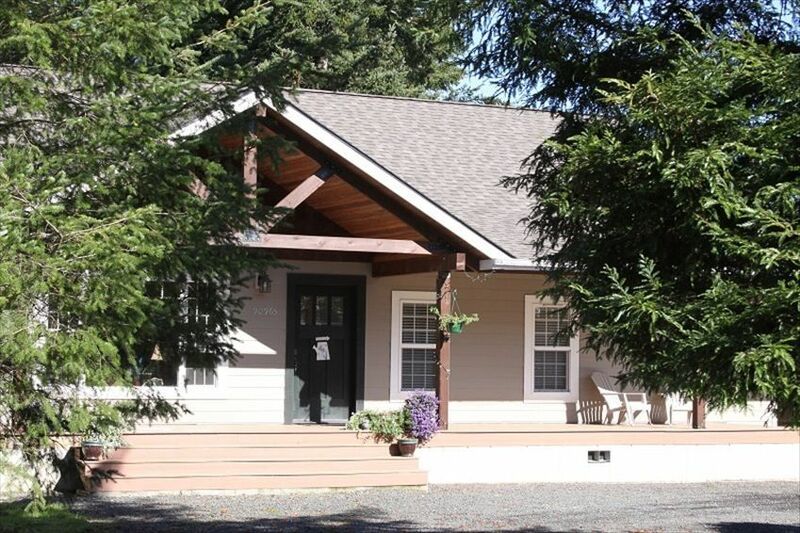 Quiet, wooded, and retreat-like setting containing a beautiful and spacious home with many amenities. Bedrooms are large with very nice linens. The front and back porches are very large with chairs for relaxing outdoors. Would definitely book this gem again. The home is very adequate, has all the kitchen amenities you would need. The deck and the yard are charming. Deer in the morning were delightful. I would say that it is in need of some updated furnishings. If you don't mind a little rough around the edges, then you will have a very nice time. The House was everything we hoped it would be. Very nice home, with everything we needed for a weekend getaway. The location was in a beautiful area, and we even had 7 deer waiting for us to arrive. The house, itself, was clean and had an unlimited supply of things a rental home should have. We thoroughly enjoyed this home. If we are ever in the area again and need a place to stay, we would definitely stay here again if it is available. Thank you! Clamming, Crabbing, fishing and Charter boats in Charleston Harbor 2.5 miles; Fishing in local rivers for Spring and Summer Steelhead and Salmon; Jump on the Oregon Dunes ATV Riding and Rentals as close as 20 minutes; Beaches, whale watching, Shore Acres Botanical Gardens State Park start at just 3 miles down the road. South Slough National Estuary for Kayaking, nature hikes, bird watching 5 miles away. Golfing at world renowned Bandon Dunes Golf Coarse 25 minutes away and local 9 hole Sunset Golf Coarse just 4 miles down the road. Horseback riding on trails and beaches with miles of beach and trail access at Horsfall Recreation Area within 20 minutes. Rates are subject to change until reservation is confirmed. Holiday rates will be higher unless booking more than 4 nights. Discounts may be provided for monthly rates. Please contact the owner for details.